Woodland (population 319) is located in upper-eastern Illiniois in the east-central portion of Iroquois County. County Road 1400N is the main roadway to and from Woodland. Illinois Route 1 passes about 2 1/2 miles to the east of Woodland. The Union Pacific Railroad passes through Woodland as well and was likely instrumental in the town's early growth. Woodland sits about three miles south of Watseka. The Woodland town history is in need of research. 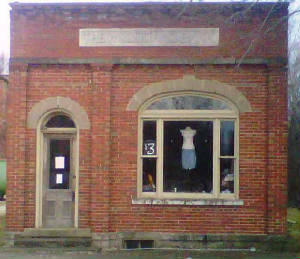 It is likely the townspeople of Woodland began a school system for their children in the late 1800s. A high school was likely in place sometime in the early 1900s. 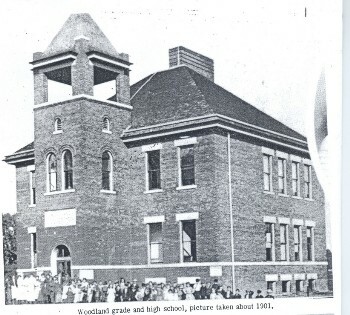 In 1901, the above pictured two story brick school house was built on the north side of Woodland. It served as a two year and then a 3 year high school as well as a grade school until 1943. At that time the high school students went to either Milford or Watseka High school. The original Woodland HS building has been razed. A newer school building has taken its place and is known as Woodland Elemetary School. Photos of this building are available below. The school serves as a 5th and 6th grade facility as part of the Watseka School District..
Woodland HS team nickname: the "Choppers"
The Choppers, though probably never more than a two or three-year high school, competed with other high schools in boys basketball. We believe the school competed in baseball, and possibly track, as well. School team colors, fight song, coach's names, and team records are all items we are looking for. The IHSA website lists the following information regarding the Woodland HS basketball program. Unfortunately, only the coaches names are available. Did this small school offer other activities for the kids? Were FFA, FHA, GAA, school plays, school dances, chorus, and band also part of the Woodland High School experience? If you have the answer to these questions, along with other memories you would like to share, read the paragraph below.